Rare Disease Patient Advocates have gained strength on Capitol Hill since I first became a patient advocate 25 years ago. That was when my son was diagnosed with a rare disease at age three. 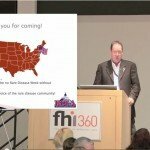 Now, we have “Rare Disease Week” when advocates come by the hundreds to speak to legislators confident that they represent 30 million Americans and 350 million people worldwide. They no longer need to explain themselves starting from scratch. Legislators are familiar with their cause and know advocates play a vital role in drug development. They know that advocates understand how public policy influences the development of new treatments. For this year’s Rare Disease Week, which took place last month, patient advocates studied the new 21st Century Cures draft legislation and then asked legislators to support it. 21st Century Cures is a bi-partisan initiative of the U.S. House of Representatives’ Energy and Commerce Committee that invited input from all stakeholders to define what needs to be done to fix our approach to drug discovery, development and delivery. In the 2014 listening phase, patient advocates had seats at the expert witness table. The 21st Century Cures draft suggests solutions to issues patient advocates have shared for decades. It proposes laws that put patients at the center of drug development. It acknowledges the advancement and potential of genetic medicine and targeted therapies. It supports modernizing our approach to data collection, management and analysis. And, it says that current laws and regulations stand in the way of developing cures. This must change. At kickoff in 2014, this initiative called the clinical trials process a “relic of another era”. Coming from the Energy and Commerce Committee, the committee of jurisdiction over the FDA, this is music to the ears of patient advocates who have long known it. In the 25 years since my son was diagnosed, I’ve seen the impact of unchecked disease on him, and on many others with rare, progressive disorders. If advocates had had their way, patient-supplied risk vs. benefit profiles of each disease would have spurred a faster, more accessible clinical trials process. That was not the norm and families have watched their children become severely disabled or die, as treatments slowly moved through clinical trials to which they had no access. We saw drugs delayed for years while lengthy safety checks took place. In some cases, when finally approved, only mild side effects from those drugs had occurred. Of course we are aware that side effects are not always mild. We know it is right to be cautious with new medicines, especially when the risk profile is not severe. So we conclude that a one-size-fits-all approach to drug regulation is a problem. We are glad to see 21st Century Cures propose a targeted approach to drug development with risk vs. benefit considerations influencing approvals. This is more feasible today because we have modern data collection, analysis and reporting capabilities. Our challenge is how to use these capabilities, along with modern science. Lots of new information is being generated as we sequence genomes, validate biomarkers, align around new endpoints and try to get better at collecting natural history of diseases. We need ways to process and apply all this great new information. The year 2000 was the first time I spoke to members of congress and the FDA to complain that clinical trials were moving too slowly, burdened by an inefficient process. I highlighted communication gaps between the FDA and sponsors. They were not interacting effectively to align intentions about trial design, surrogate endpoints and lack of natural history data to validate endpoints. I also protested that families’ risk vs. benefit concerns, and disease progression, were not considered. These communication gaps were causing time—and lives—to be lost. Endpoints, biomarkers, natural history and risk vs. benefit are still issues today, but there are modern attempts to address them. We see communication improving. 2012 PDUFA V legislation, including the FDA Safety and Innovation Act, includes mandates to incorporate the voice of the patient in drug development, and to provide guidance on surrogate endpoints. In cases of Breakthrough Therapy Designation, PDUFA V provides for specific communication between FDA and sponsor during a clinical trial. Perhaps this was the missing communication we complained about in 2000. So how’s that working? Initial testimony from the FDA and sponsors was good: sponsors were applying, and the FDA was using an “all hands on deck” approach to communication and evaluation when Breakthrough Therapy Designation was granted. Of course, this needs to be tracked and appreciated as a work in progress. Over time, we’ll learn how PDUFA V’s new mandates actually work to speed up drug development. Advocates think these improvements lack teeth, and there are other factors of concern besides mandates placed upon the FDA. The FDA and NIH need budget and mandates that are aligned. Over a decade of cuts to their budgets and sequestration have held back drug development. As its mandates increase, the FDA needs resources and freedom from constraints. We also need a productive NIH that can do the basic science that so effectively feeds the private sector. Case in point: The Human Genome Research Project done at NIH that has triggered so much development of genetic medicine by companies in the private sector. Going forward, there is much to be done. Alignment of budgets and mandates are things legislators can do. Along the way, patients need to step forward, share their data and participate in clinical trials. Drug developers have to step up and start gathering and managing data using modern systems to reduce waste, leverage data and scale up their rate of approval. As an industry, drug developers came late to using modern computing. Now that they’re embracing it, there is catching up to do. Our progress is exciting, but we still only have around 500 treatments for 7,000 rare diseases. Common, progressive diseases share common cause. If we do succeed in getting a lot of needed 21st Century Cures type reform into the law, it remains the task of all stakeholders to “work it” as if we actually live in the new century we just defined. Steve Smith is Director of Patient Value at Medidata.